Our outdoor furniture is all Amish handcrafted in the USA. 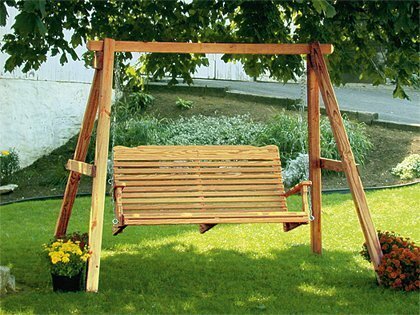 Our outdoor swings are the most popular Amish furniture that we sell. Create an outdoor oasis and escape with new furniture to fit your space. If you need help planning and deciding call one of our furniture specialists for assistance. They are happy to help in anyway that they can. This Amish porch swing is made from unfinished environmentally friendly pressure-treated Southern pine wood and comes standard with stainless steel screws to stand up to years of outdoor use. The swing edges have been smoothed and rounded to eliminate splinters. The Amish porch swing comes with a zinc plated chain that fits an 8’ or 9’ ceiling. Pictured with Amish Made A-Frame Swing Stand, if you would like more information on the A-Frame visit here.